Aft turrets of USS Delaware B-28 about 1913. Note the practice guns atop each barrel. U.S. Naval Historical Center Photograph # NH 54666. This weapon was used on the last pre-dreadnoughts and the first dreadnoughts of the US Navy. The arrangement of the gun turrets on the first US dreadnought, USS South Carolina (B-26), with one turret firing over the other (superfiring) at each end of a compact superstructure, was far more efficient than that of any of the "pre-dreadnought" designs, and, for that matter, of HMS Dreadnought herself. In less than a decade, the use of superfiring turrets became the standard for all nations' capital ships. During target practice in 1916, USS Michigan (B-27) cracked the chase hoops on two of her guns. An investigation of similar guns on USS South Carolina (B-26) showed that copper deposits from the projectile driving bands had narrowed down the bores, which slowed the projectiles and thus greatly increased the barrel pressures (problem known as "copper choke"). Lapping heads for guns 12" (30.5 cm) and larger were issued to all ships for removing these deposits. Later, these were replaced by wire and pisaba brushes. 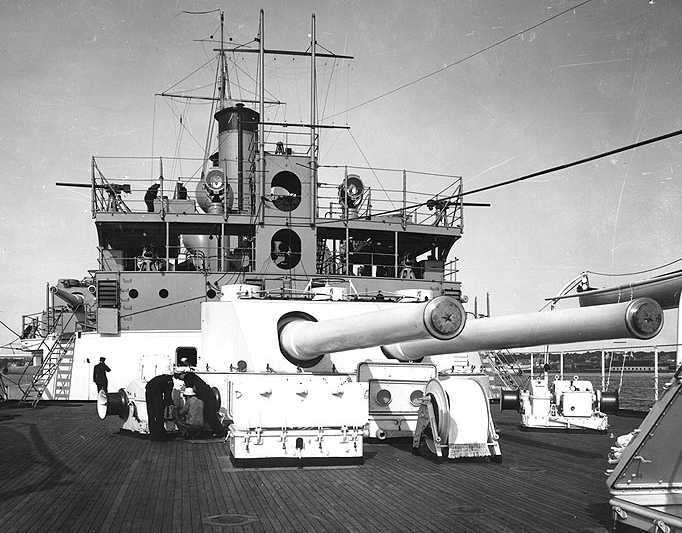 Under the provisions of the Washington Naval Limitation Treaty of 1922, most of the ships armed with these guns were scrapped during the mid-1920s. Many of their guns were then transferred to the US Army where they were employed as coastal artillery. At the end of World War II, some of these guns were sold to Brazil for use in their coastal batteries. In 1908 AP projectiles were fitted with a longer ballistic cap of 7crh which improved their penetration ability at longer ranges. Constructionally, the Mark 5 was essentially a lengthened 12"/40 (30.5 cm) Mark 4. The Mark 6 was very similar except that it had seven hoops vs. six in the Mark 5. It is not clear if any Mark 6 guns were actually used in service. A note on sources: Appendix D of "U.S. Battleships: An Illustrated Design History" by Norman Friedman states that the USS Connecticut (B-18) and USS Mississippi (B-23) battleship classes carried 12"/40 (30.5 cm) guns. Other sources disagree and state that these ships carried 12"/45 (30.5 cm) guns. Through an analysis of information in "United States Naval Guns: Their Marks and Modifications," several photographs and, ironically, aided by notes in another book by Dr. Friedman, "US Naval Weapons," I have concluded that these ships actually carried the 12"/45 (30.5 cm) gun and that Dr. Friedman in "U.S. Battleships" is in error. The data that follows is specifically for the 12"/45 (30.5 cm) Mark 5 Mod 9. ^Early mods had "hook" rifling, where the grooves were not uniformly shaped. The values given here for grooves and lands are for the later "rib" rifling. ^The original Rate of Fire was greatly improved by more careful loading practices and better training. ^Common was obsolete by 1915 and no longer in production. ^The designers of the dual-caliber ships assumed that most damage to enemy ships would be done by the medium-caliber guns and thus the larger caliber guns would not fire many rounds before the battle ended and for this reason had relatively few rounds. With the introduction of the single-caliber ships and the improved rate of fire, the number of rounds per gun was greatly increased. This data is for face-hardened Harvey plates from "Ordnance Data Sheets" of 1905 as published in "US Naval Weapons" and is for the older shell design. This data is from "Elements of US Naval Guns" of 1918 as published in \US Naval Weapons" and is for the 7crh projectile. Data is corrected for angle of fall and may also refer to harder armor than that used for the 1905 data. ^The Mark 7 introduced all-electric power to USN turrets, although electric motors had been widely used in previous designs. ^The Mark 8 was similar to the Mark 7 and was the last US large-caliber turret design to have a mark number. ^The thickness of the armor protection was the main difference in turret weights between the different mark numbers. As in all US pre-dreadnought designs, these turrets had endless chain hoists running on unenclosed rails direct from the lower chambers to the loading position. 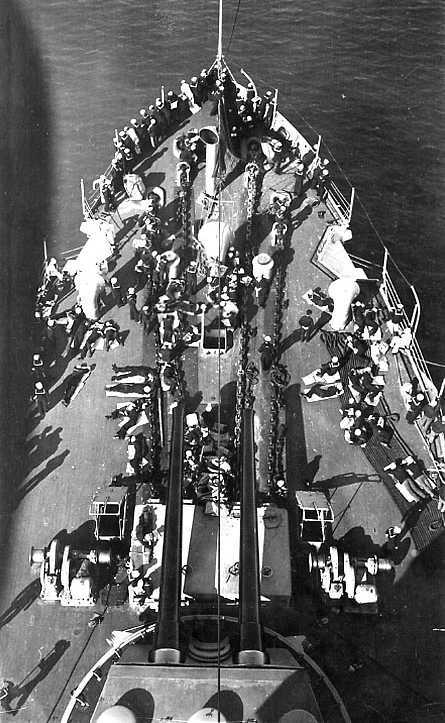 After an accident on USS Missouri (B-11) in April 1904 that saw a flare-back from a gun breech go straight to the handling room and which killed five officers and twenty nine men, automatic shutters were installed to separate the ends of the hoists. 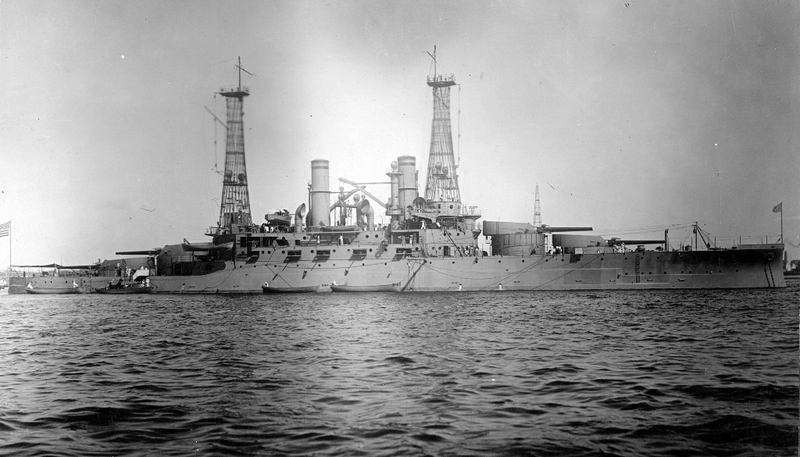 In April 1906, exposed switch gear on USS Kentucky (B-5) caused a powder burn that killed 10 officers and men. 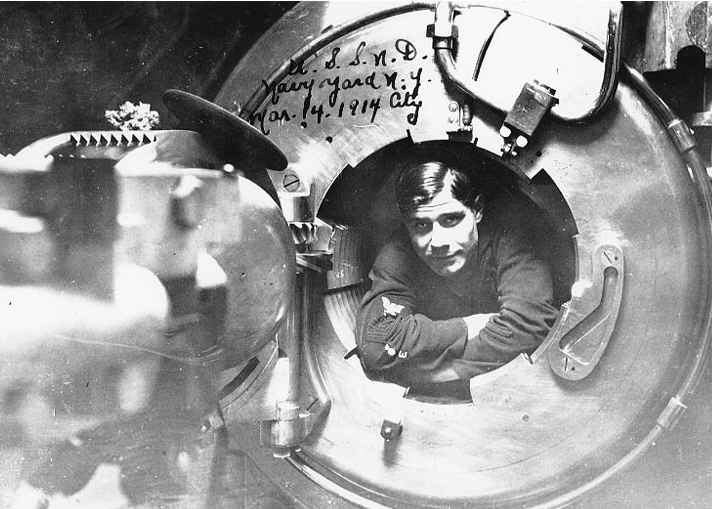 As a result, all electrical equipment that might cause a spark hazard was removed from all USN mountings between 1907 and 1908. Bulkheads were installed in the turrets between guns and breech gas ejectors were fitted to prevent flarebacks in the future. These changes became standard on all subsequent designs. USS South Carolina (B-26) was the first US battleship to have two-stage projectile and powder hoists. Cars now carried both shell and powder from lower to upper handling room, where they were rammed by hand through flap-covered openings into upper hoist cars, which in turn carried them to the guns. Training was by two 25 hp motors and each gun had a 15 hp motor for elevation. A 10 hp motor drove a chain rammer carried on an extension of the cradle. All electric motors were duplicated by manual hand drives as a backup. In the upper handling room, ammunition was transferred between hoists by a rammer powered by a 10 hp electric motor. The hoists for the South Carolina class were developed by the Washington Navy Yard and proved to be satisfactory. However, the ones for the Delaware class (B-28) were designed by Bethlehem Steel and proved so troublesome that they were removed. Improvised fittings in their place consisted of rope whips. These turrets used the "grass-hopper" counter recoil system whereby a spring box, located under the gun pit, was connected via two heavy, pivoted arms to the gun yoke. See 10"/40 (25.4 cm) datapage for a sketch. USS South Carolina (B-26) was the first US ship to use the "hyposcope," a new type of gunsight which used a series of mirrors to remote the point of aim. This device was rigidly connected to the gun trunnions and set into the side of the turret. Previous gunsight designs were located on the turret roof in hoods and were connected by a complicated linkage to the guns. This resulted in "lost motion" as the slack in the linkage connections meant that the gunsights could not exactly follow the gun elevations. At short ranges, this lost motion was not significant, but as the range increased, the accuracy became worse. With the hyposcope, a range transmitted from any gun to the other guns on the ship meant that they could all now be pointed at the correct elevation, hence the patterns became tighter. 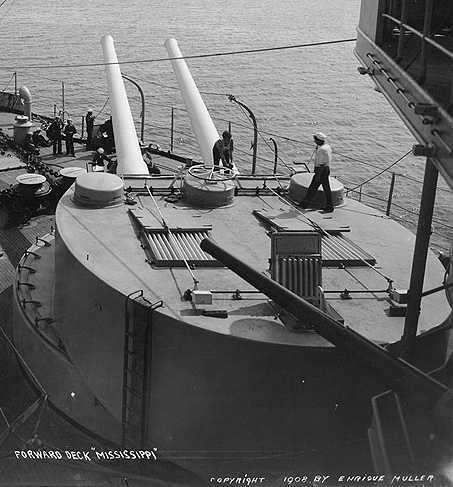 Each gun in these turrets elevated separately, but there was a single sightsetter in each turret who was responsible for setting the correct range for both hydroscopes. A third sight was provided for the gun mount trainer and this projected up through the turret roof. It has been suggested that these characteristic turret-side sights on US warships were adopted in order to allow superfiring guns to shoot directly over the lower turrets, but this does not seem to be the case. The lead designer, Chief Constructionist Washington Capps "appears neither to have feared trouble from the blast nor to have considered end-on fire important" - Norman Friedman in "U.S. Battleships." Experiments to verify the new superfiring battleship design were conducted using the monitor USS Florida (M-9) modified with one of her 12" (30.5 cm) guns re-located in the superstructure so that it fired over her turret. The turret itself was modified to represent those planned for USS South Carolina with the exception that the gunsights were mounted further aft so as to be closer to the muzzle of the superfiring gun. Tests conducted on 6 - 15 March 1907 with full charges and with the sights directly below the superfiring gun were completely successful with the official report stating that "the shock felt was trifling, and the officer at the sight felt no jar, nor was his vision of the horizon interrupted otherwise than by the smoke of the discharge." The only design change made to the turret designs on subsequent ships as a result of these tests was a slight thickening of the turret roofs. 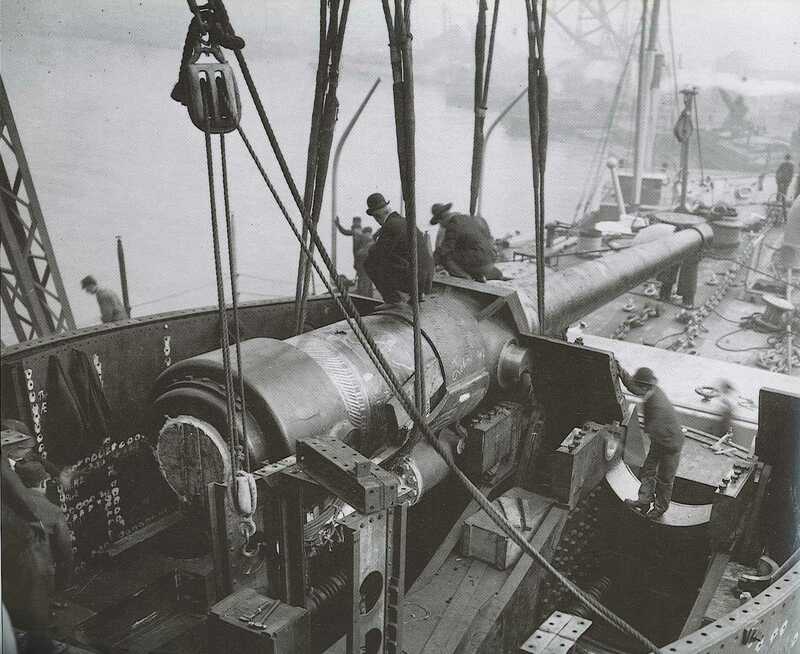 USS Connecticut B-18 getting one of her bow 12"/45 (30.5 cm) guns installed on 31 January 1906 at the New York Navy Yard. 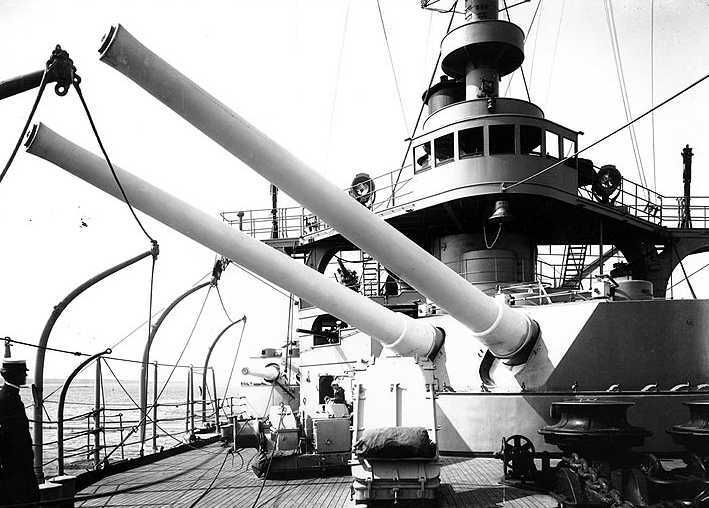 Bow turret on USS Conneticut B-18 during the Great White Fleet expedition. U.S. Naval Historical Center Photograph # NH 2400. Forward 12"/45 (30.5 cm) Turret of USS Mississippi B-23 in 1908. U.S. Naval Historical Center Photograph # 19-N-60-10-14. Another view of the forward turret on USS Mississippi B-23 in 1908. Note spotter towers, ventilation hatches and the 7"/45 (17.8 cm) gun in the foreground. U.S. Naval Historical Center Photograph # NH 46043. Aft 12"/45 (30.5 cm) Turret of USS Mississippi B-23 in 1908. Note wing 8"/45 (20.3 cm) and 3-pdr guns in the superstructure. U.S. Naval Historical Center Photograph # 19-N-60-10-12. USS South Carolina B-26. The first US dreadnought and the first dreadnought anywhere with superfiring main-caliber turrets. U.S. Naval Historical Center Photograph # NH 44252. Breech of 12"/45 (30.5 cm) Mark 5 gun on USS North Dakota B-29. U.S. Naval Historical Center Photograph # NH 100784. 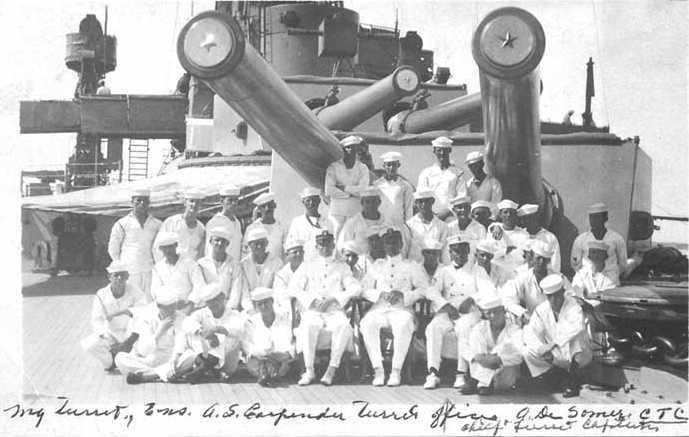 Crew of Turret I on USS Utah B-31 in 1913. U.S. Naval Historical Center Photograph # NH 103835. 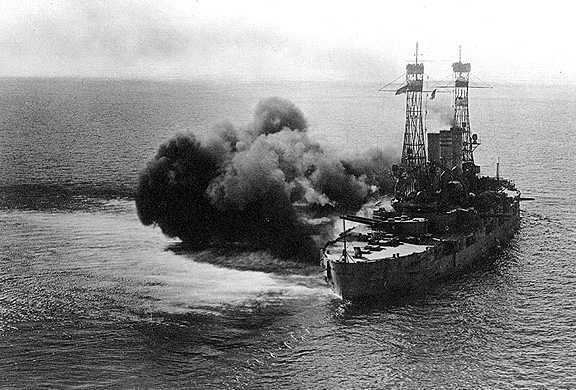 USS New Hampshire B-25 firing on the target ship San Marcos (ex-Texas) at Tangier Sound in Chesapeake Bay, March 1911. This photograph is of historical interest as it was one of the first gun shoots where a spotter in the cage masts was used to spot fall of shot. Previously, each gun layer or turret captain utilizing their turret gunsights was responsible. This new technique increased the maximum possible engagement range from 12,000 yards (11,000 m) up to about 24,000 yards (22,000 m). Also note the ship's wake and that firing a broadside did not push the ship sideways. U.S. Naval Historical Center Photograph # NH 73105. 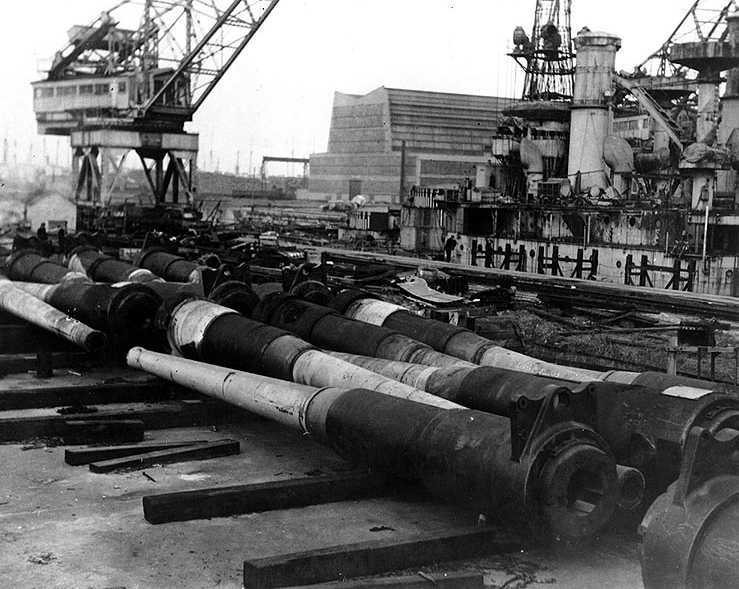 12"/45 (30.5 cm) guns removed from scrapped battleships at the Philadelphia Navy Yard in December 1923. Many old battleships were scrapped as a result of the Washington Naval Limitation Treaty of 1921. 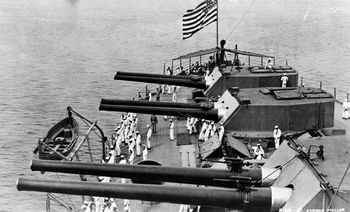 One of these guns is marked "Kansas", presumably indicating that it came from USS Kansas BB-21. Ship being dismantled in the background is USS South Carolina BB-26. U.S. Naval Historical Center Photograph # NH 69035.